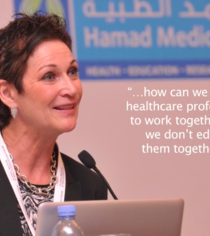 The inaugural IGHPE 2015 Annual Conference brought together global and regional experts to discuss the vision, opportunities and challenges for a range of innovative programs in global and regional health and medical education. Held in Doha, which in recent years has emerged as a regional hub for higher education and biomedical research, the conference brought together speakers, poster presenters, moderators and discussants from organizations involved in medical education, assessment, licensing and program accreditation from all over the world. The conference also featured work conducted at Weill Cornell Medicine-Qatar with multiple regional collaborators, highlighting the improvements in education and training in a wide variety of settings in the Middle East and North Africa region. Delegates discussed both evolutionary and disruptive innovations, addressing initiatives that have the capacity to transform healthcare professional education in the region and globally. Delegates were also invited to use the opportunity to identify new collaborative programs and partnerships that could continue to enhance medical education and improve global health.